Hemp Board is a beautiful, versatile sheet board for non-load-bearing purposes, decorative use (cladding, accent, etc.) and substrates. It offers stability and durability while helping both the natural ecosystem and local economies. Hemp Board is comparable in performance to other wood-based board products and is FORMALDEHYDE-FREE ! Its unique visual texture can be stained and sealed and supports LEED certification. Made in the USA with American grown hemp, HempBoard is an engineered wood product constructed from the fiber of the hemp plant. 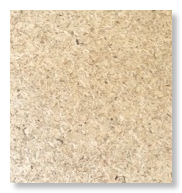 HempBoard can be used in place of wood particleboard or medium density fiber board. This board is very versatile and can be used for applications like cabinets, furniture, shelving, sub-flooring, molding, doors, or other simple wood structures. Our HempBoard uses non-formaldehyde binders and is engineered for particleboard applications and comes in two thicknesses: 1/2" and 3/4”. 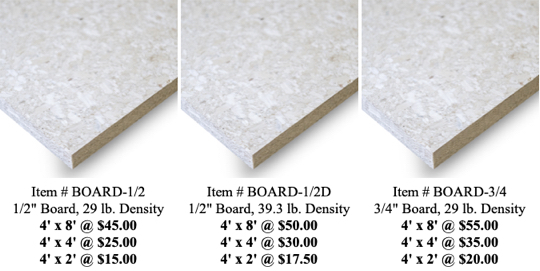 We also have a second 1/2" thick board which is heavier, denser, and stronger. 80% of the world's forests are already destroyed and 80,000 acres of forests disappear from the Earth every day !!! Almost 1/2 of those 80,000 acres of trees are chopped down and processed into pulp for making paper products and engineered wood products. Deforestation has many negative consequences including but not limited to global climate change, species extinction, loss of medicinal research and desertification. Traditional binders used for engineered wood products use toxic formaldehyde, a carcinogen that is extremely dangerous when inhaled or exposed to humans. The binders used in our hempboard do not contain any formaldehyde and are safe for indoor use. HempBoard is an environmentally sustainable alternative to particleboard that meets or exceeds particleboard industry ANSI specifications. Applications include acoustic ceiling tiles, furniture, cabinets, countertops, door cores and underlayment.